As data shows that the U.S. will become a minority white nation by the year 2045, the survey asked respondents whether or not the nation's ethnic and racial "realignment" is positive or a negative thing. When asked about the growing number of "newcomers" to the United States, white evangelicals (57 percent) were the only major religious group to have a majority say that immigrants "threaten traditional American customs and values." PRRI also found that although most Americans oppose a hypothetical law to ban refugees around the world from being able to come to the United States, about half of white evangelicals (51 percent) would support such a law. Almost as many white mainline Protestants (47 percent) said they support a refugee ban. The data also finds that white evangelicals were the group least likely to oppose a policy of separating immigrant children from their families at the U.S.-Mexico border. A majority (56 percent) of white evangelicals opposed such a policy while 68 percent of white mainline Protestants, 69 percent of white Catholics and 71 percent of Hispanic Catholics, 81 percent of Hispanic Protestants and 85 percent of black Protestants said the same. When it comes to a "temporary travel ban for people from some majority-Muslim countries," 72 percent of white evangelicals favor such a policy. Meanwhile, 63 percent of white mainline Protestants and 60 percent of white Catholics also favor a temporary travel ban. Hispanic Protestants were more divided with 46 percent favoring a ban and 54 percent opposing. Thirty-four percent of Hispanic Catholics and black Protestants also favor a temporary ban on travel from some majority-Muslim countries. In the panel discussion, Wong admitted that she had to make some changes to her new book Immigrants, Evangelicals, and Politics in an Era of Demographic Change following the outcome of the 2018 election. "When you look at the [PRRI] report, [marriage and abortion] are a very low priority for Republicans and for white evangelicals. The real key to understanding white evangelicals is through their anti-immigrant attitudes and fear of demographic change," Wong explained. "They are the group that is most conservative on the travel ban. They are also the most conservative of family separation, which to many people is a moral issue." "They are also the only religious group to contend that immigrants threaten American values," she added. "It is really this potent mix of nativism and racial anxiety and white Christian nationalism that underlines many of the other policy attitudes that you see presented in this report." While 69 percent of Americans feel that Trump has "damaged the dignity of the presidency," White evangelicals are the only religious group to have a majority (53 percent) that says that Trump has not "damaged the dignity of the presidency." "Why do they stick with Trump?" Wong asked during the panel. "Because Trump's immigration agenda is the white evangelical immigration agenda. I think that has become very clear." 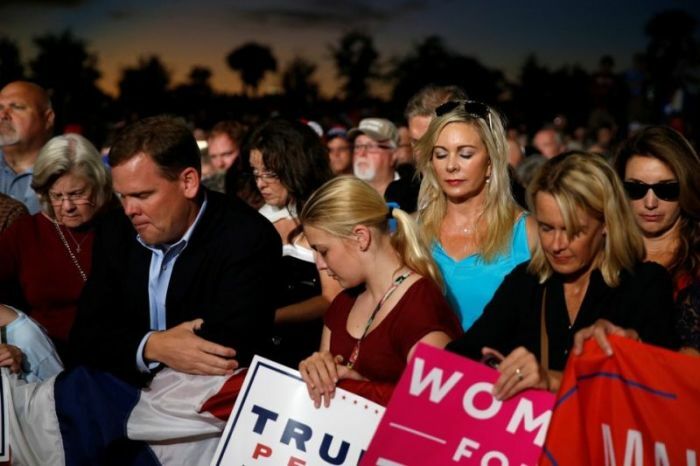 PRRI CEO Robert Jones, who authored the 2016 book The End of White Christian America, opined during the panel that Trump has turned the "vales voters" wing of the Republican Party into the "nostalgia voter wing." "That brought together that old kind of Christian Right coalition, it pulled in the Tea Party folks as well," Jones said. "And that white working class voter kind of fell under that rubric as well." White evangelicals are also the only religious group to have a majority of respondents (60 percent) that believe that churches and houses of worship are responding "well" to issues of sexual harassment and assault.